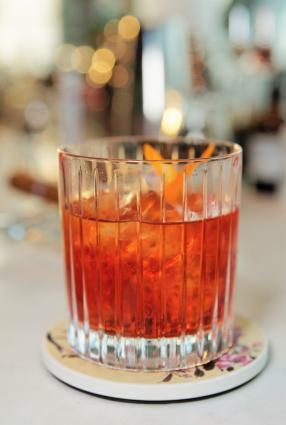 The old fashioned is a classic cocktail that almost faded into obscurity before enjoying a resurgence sparked, in part, by the television show Mad Men. Although there's a basic recipe for the drink that calls for whiskey, bitters, sugar, water and ice, there are almost as many slight recipe variations as there are bartenders preparing this drink. Use Bourbon or rye, a sugar cube or simple syrup, muddled fruit or none at all; everyone has a preference, so the trick is finding your favorite version of this drink. The following recipe is as good as any to represent this cocktail. According to an article in Esquire Magazine online, muddled fruit wasn't part of the recipe until the Prohibition era, when the fruit was used to disguise the liquor. If you're not a fan of muddled fruit in your cocktails, leave it out and follow the alternative directions. Put the sugar cube (or simple syrup) in an old fashioned glass, add the bitters over it, and then add the water. Add the cherries and orange slice, and muddle it all together. Add the ice to the glass, pour the spirit over the ice, and stir. Some cocktail aficionados skip the muddled fruit and, instead, twist a slice of orange peel over the top of the drink and then drop it in for garnish. If that's still too much fruit for you, forget it altogether. The Angostura bitters are enough to do the job. Should you use Bourbon or rye in this cocktail? Everyone has an opinion, but there are some differences between these two spirits that will help you decide which one to use in your drink. Rye whiskey is distilled with rye, so it has a bit of a bitter taste, and it's a little on the sharp side. Bourbon is distilled with corn, so it has a more mellow flavor and a hint of sweetness. Overall, it's considered softer than rye. So, the spirit you use in your Old Fashioned really depends on your flavor preference. Some people feel the sugar cube and muddled fruit already add enough sweetness to the drink, and the rye makes a nice counterpoint in flavor. Others feel that Bourbon blends well with the fruit and doesn't have the bite that rye brings to this cocktail. Perhaps the best plan is to sample both versions of this drink and decide which one you like best. If you truly have no preference, feel free to enjoy either version whenever you like. The old fashioned is one of those cocktails everyone should try at least once. If you don't enjoy the classic recipe that calls for some type of whiskey, you can substitute almost any other spirit to put a different spin on the flavor. In its current incarnation, the old fashioned is definitely open to interpretation.